When we come across the story of the raising of Lazarus we may be tempted to skim through it or even skip over it altogether; we are thinking that we have heard this one before and yes, we have. But if we set aside a quiet time and a quiet place to read this account of an event that took place two millennia ago . . . and when we pause to mediate on the meaning of the words beyond the story . . . we feel Christ’s presence through the questions that spring up from the pages. And we are given new gifts of wisdom. Here is one such gift I received this afternoon . . . you may want to offer up your own. Verse 16: So Thomas, called Didymus, said to his fellow disciples, “let us also go to die with him”. Thomas knows that if Jesus and his followers return to Judea – they have heard the news of Lazarus’ death – they may very likely be stoned, we understand, because earlier the disciples caution Jesus saying: “Rabbi, the Jews were just trying to stone you, and you want to go back there?” Thomas is usually remembered in John 20 as the doubter, the one who refuses to believe that Jesus has returned from the dead until he has seen the crucifixion nail marks and has put his own hand in the wound in Jesus’ side. 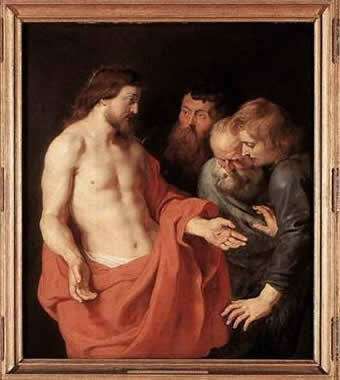 Perhaps John uses Thomas in this way to give us the opportunity to examine our own belief in the risen Christ. Do we demand signs or do we willingly follow . . . even when danger is imminent? Jesus has told us about the many ways in which he appears to us. Do we willingly follow with enthusiasm as Thomas hopes to do? Maybe we willingly respond as Thomas does when we realize that we have doubted Christ himself . . . My Lord and my God! Today we have the opportunity to think about our readiness to respond as Thomas does when we encounter Christ in any form. We are perhaps uncomfortable approaching the poor, the stranger, the needy and the imprisoned yet Jesus lives in them as he lives in us. He is not only present in those who look like us and behave as we do . . . but in diverse others as well. This gives us something to think about today . . . and it is an opportunity to draw nearer to Jesus. There are other small places that call us to examine our way of perceiving Christ in others. We may want to explore the verses that describe Jesus’ encounter with Martha and Mary. Why does Martha tell Mary secretly that Jesus has arrived? Why does the writer describe Jesus as perturbed? What causes Jesus to cry? And what do we discover about ourselves when we read verse 48? When we arrive at the close of Chapter 11 we are told how dangerous it was to even know Jesus’ location; and we understand that members of the Sanhedrin clearly prefer land and nation over following and coming to know one who might be the Messiah. How do we react to these chilling words? And so we read, we pause, we reflect . . . and then we pray: Good and faithful brother, we read this account of how you comforted your friends and called Lazarus back to this life. We also have read about your sadness and unease. We have understood the danger you were in . . . and that you know we are often in danger when we follow you. Yet we know that your words and your actions bring about the peace that all of us yearn to hold. We know that you are our wise teacher and loving shepherd. We know that where you go there will be questions, yet we follow because we want answers. We know that that where you go the old order will be questioned, yet we follow because with you we are unafraid. We know that where you go there will be peace . . . and so we follow for this is also how we wish to live. Guide us always, protect us always, be with us always . . . for we are trying to follow . . . you. Amen. We will be away from the Internet for several days. Please enjoy this reflection first posted on July 3, 2011. As we begin to conclude our thoughts on God’s glory, we look at a reflection written on August 22, 2007 and adapted today as a Favorite. We hear this story often on the Sunday after Easter, when the pews that had been overflowing the Sunday before now stand strangely vacant. I always think it sad that more of us do not hear this story, because there is a bit of Thomas in each of us. We would be false apostles as those we read about in Revelation 2:2-3. “I know your works, your labor, and your endurance, and that you cannot tolerate the wicked; you have tested those who call themselves apostles and discovered that they are imposters. Moreover, you have endured and have suffered for my name, and you have not grown weary.” The writer of Revelation, John of Patmos, also cautions that we are to repent, warning that the light of our lampstand will be extinguished if we lose the love we had at first. We must realize who and what we are, we must repent and repair, forgive and ask forgiveness, heal and be healed, question and discuss. We must seek so that and we will ultimately find God’s eternal, healing and inexplicable glory. Using a search engine, we look for images of Doubting Thomas and study this story as we consider the questions we present to God . . . and the answers we receive. Knowing that through humility, emptiness, and service, our journey leads us more quickly to the kingdom of God we seek. Today’s lesson on Glory: Mary Magdalene and the other apostles discover an empty tomb and at first believe that Jesus has left them behind. Through many “wonders and signs,” Jesus assures them of his very real presence. Each Easter we spend time with this chapter of John’s Gospel, reliving the passage Jesus’ followers make from emptiness to fulfillment. It is very like the same passage we make each time we traverse a difficult patch of our lives. We might re-read these verses when we find ourselves in the emptiness of betrayal, denial or abandonment. They hold stories we will want to re-live and re-tell. The Empty Tomb – Mary Magdalene came to the tomb early in the morning, while it was still dark, and saw the stone removed from the tomb. We might better manage our disappointments, fears and troubles if we remember that fulfillment follows this emptiness. The Appearance to Mary of Magdala – Mary stayed outside the tomb weeping. And as she wept, she bent over into the tomb and saw two angels in white sitting there, one at the head and one at the feet where the body of Jesus had been. And they said to her, “Woman, why are you weeping? We might better experience peace for the hatred we encounter in the world if we leave ourselves open to the visits of angels. The Appearance to the Disciples – On the evening of that first day of the week, when the doors were locked, where the disciples were, in fear of the Jews, Jesus came and stood in their midst and said to them, “Peace be with you”. We might better discover unity in our divisions if we look for Christ who is always in our midst. Thomas – Thomas was not with them when Jesus came and so he said to the disciples, I will not believe”. Now a week later his disciples were again inside and Thomas was with them. Jesus came, although the doors were locked, and stood in their midst and said, “Peace be with you”. Thomas said, “My Lord and my God!” We might better understand our role as branch to Jesus’ vine if we accept Jesus’ love with humility. Signs and Wonders – Now Jesus did many other signs in the presence of his disciples that are not written in this book. But these are written so that you may come to believe that Jesus is the Messiah, the Son of God, and that through this belief you may have life in his name. We might better hold firm in our love of Christ if we humble ourselves before the many signs and wonders we experience in our lives. We might compare varying versions of John 20 and connect these stories to the hills in valleys in our own lives. Search this blog for reflections from John 20 and re-think the Easter miracle. Easter is an eight day celebration beginning on Easter Sunday, running through the Easter Octave and ending on the Second Sunday of Easter. This tradition reflects the joy the early apostles felt as they experienced the new presence of the Risen Christ. Jesus offers us this same experience today. Wishing all those who follow the Noontimes a graced and peace-filled Easter Thursday. Our culture wants hard facts and raw numbers. It sees humans as targets for marketing rather than reflections of God’s hope in a troubled world. The science of polling and focus groups is our newest religion while belief in miracles, acting in faith, and loving in hope are qualities that are seldom valued. Today the Apostle Thomas brings us the opportunity to measure what is truly important. Today we are given a chance to determine how well we live out the message of the Gospel. We are asked to look at how well we have become God’s message of hope to the world. So they set out at once and returned to Jerusalem . . . In the moment that Cleopas and his companion realize that they have been journeying with Jesus, they rise from the supper table to return to Jerusalem. The place that a short time before had symbolized disappointment, defeat and danger now is the focus of all their hopes. They must return to tell the other disciples what has occurred on the road to Emmaus. So must we tell others about the Easter story as we place all our hope in Christ. They found gathered together the eleven and those with them who were saying, “The Lord has truly been raised and has appeared to Simon!” Then the two recounted what had taken place on the way . . . The Emmaus disciples rejoice with the disciples who had stayed behind in Jerusalem; they celebrate the reality that the Christ is still with them. So must we rejoice as we celebrate with Christ. While they were still speaking about this, he stood in their midst and said to them, “Peace be with you”. But they were startled and terrified and thought that they were seeing a ghost. It is difficult to ask our reason to bow to the miracle before them. A few short days from now Thomas will stand before them insisting on hard evidence that Jesus has returned. He must see and touch before he will believe; yet Jesus invites offers Thomas the evidence he needs in order to believe. So might we be startled and terrified; so might we believe. Then he said to them, “Why are you troubled? And why do questions arise in your hearts? Look at my hands and my feet, that is it myself. Touch me and see, because a ghost does not have flesh and bones as you can see I have”. Rather than preach to us, Jesus talks with us. He never ceases to tell us in every way he can that he understands our circumstances and our emotions. So might we be troubled with fear and doubt; so might we touch, see and trust. While they were still incredulous for joy, and were amazed, he asked them, “Have you anything here to eat?” They gave him a piece of baked fish; he took it and ate it in front of them. Jesus still shares a meal with his friends just as he has done so often before. He demonstrates undeniably that he is real for a phantasm cannot eat and drink and laugh with them. So might we be amazed and incredulous; so might we share a familiar and intimate meal with Christ. Then he opened their minds to understand the scriptures . . . The Teacher never misses an opportunity to instruct them again on the Law of Love and the newness of God’s Kingdom. The disciples allow themselves to be open to The Word. So might we listen for the voice of Jesus; so might we be open to The Word. Then he said to them, “You are witnesses of these things . . . but stay in the city until you are clothed with power from on high. Jesus requires affirmation from his followers. He also counsels them on the next steps they must take in their newly found work of Kingdom-building. So are we called to be witnesses. So are we clothed with power from on high. So are we sisters and brothers of Christ. So are we Children of the Living God. So are we loved both deeply and well. So are we. So are we. So are we. Tomorrow, at the Sea of Tiberius . . . Unless I see the mark of the nails in his hands and put my finger into the nailmarks and put my hand into his side, I will not believe. The loveliness of Thomas is that he is passionate; he leaves no doubt in anyone’s mind what is required to bring him to the conclusion that Jesus is risen. We might see ourselves or someone we well know in this story today. We may even be Thomas ourselves. A week has passed since the incredible event at the garden tomb; so many rumors fill the Jerusalem air that it is impossible to sort through them. The disciples are again inside, we are told, and this time Thomas is with them. Jesus came, although the doors were locked, and stood in their midst and said, “Peace be with you”. Again the stunned surprise as the disciples look to one another to see who still stands in doubt. It is likely that Thomas is not the only follower of the Teacher who needs convincing of the mysterious truth that Jesus is no ghost but a man, scarred by his crucifix experience, but still . . . a full, living, breathing, resurrected man. Not resuscitated as was Lazarus, but risen. The disciples in the Upper Room struggle once more to gain the peace Jesus so easily grants them. All eyes move back to Jesus, who holds out his hands palms upward as he says to Thomas, Put your finger here and see my hands, and bring your hand and put it in my side, and do not be unbelieving, but believe. Thomas’ response is five brief words that contain the theology by which he will live out the remainder of his days – a theology by which we too might easily live our entire lives . . . if we might only see and believe: My Lord and my God! We might wonder what words erupted from the other disciples who may have chided Thomas for his lack of belief. We might imagine that there was a new solemnity in the air as these friends struggled to find new footing in this new place of total faith. Or we might as easily believe that they fell into conversation just as they had so often done before this last Passover. John does not record any detail but what we can see is Thomas’ unrelenting passion. As strongly as he insisted on seeing evidence before committing himself to this incredible belief . . . he now as strongly validates the mystery standing before them. My Lord and my God! Good and forgiving God, visit with us this day and each day in such a way that we cannot deny you: My Lord and my God! Good and patient God, remain with us through our days of doubt and our nights of fear in such a way that we will always praise you: My Lord and my God! Good and loving God, guide us in our times of trial and our times of rejoicing in such a way that we will always love you: My Lord and my God! Tomorrow, the road to Emmaus . . .